The Woodland Park Zoo and Seattle University are launching a study that looks at the living patterns and habitats of carnivores in Seattle, including raccoons, coyotes, and foxes. Have you ever spotted a coyote in Seattle and wondered how it thrives in such as urban environment? A zoo study that’s slated to launch at the end of December will look at just that. 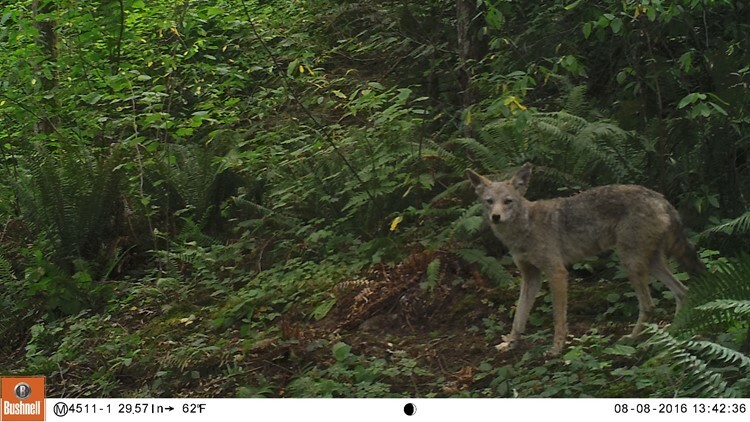 The Seattle Urban Carnivore Project, which is a collaboration between Woodland Park Zoo and Seattle University, aims to learn more about carnivores, including coyotes, and how they’re living in urban areas. Long is one of the co-coordinators of the project along with Seattle University Associate Professor Mark Jordan and Woodland Park Zoo Science & Conservation Education Supervisor Katie Remine. Scientists will place wildlife cameras in parks and neighborhoods to track the animals’ activity and see where carnivores – such as raccoons, coyotes, or foxes – live, what time of day they’re most active, and understand how many are living among us. Cameras will be focused along two transects: the first runs east from downtown Seattle to Magnuson Park and on to Woodinville; the second goes from downtown Seattle to the Duwamish River near West Seattle and then goes east. Knowledge about coyotes in Seattle is pretty limited at this point, according to Long. Scientists don’t have a good grasp on how many coyotes live in Seattle, how their population may have fluctuated over the years, or even where in Seattle they’re most likely to live. However, they do know coyotes tend to stay in denser vegetation and are very adaptable. While coyotes can travel large distances, they are constrained in an urban setting and could make use of even a small strip of vegetation along a canal or a highway. “They’re constantly surprising us,” Long said. Coyote sightings tend to spike in the fall, but Long said that didn’t necessarily mean there’s more them. One explanation is pups that were born in the spring and summer are trying to disperse and find their own place. The young animals may be roaming in a new area and get close to people or show up in unexpected locations. By winter they likely have found a new home and aren’t seen as frequently. Several coyotes have been spotted this fall in Seattle neighborhoods, including Ballard and Wallingford. The project also includes a community engagement piece to educate people and work with communities to develop policies to help people coexist peacefully with carnivores. Researchers also hope to launch a community website by February or March where people can report sightings. Coyotes are typically not dangerous to humans, and attacks are rare. To prevent coyotes from getting habituated to humans, the Washington Department of Fish and Wildlife advises not leaving garbage cans out at night, keeping pet food indoors, and not leaving fallen fruit or birdseed on the ground. Protect animals by keeping cats and dogs inside at night and enclose backyard chickens in a secure pen. “A little bit of education or information and putting the control back in the people’s hands in terms of managing their space and coexisting can go a long way,” Long said.